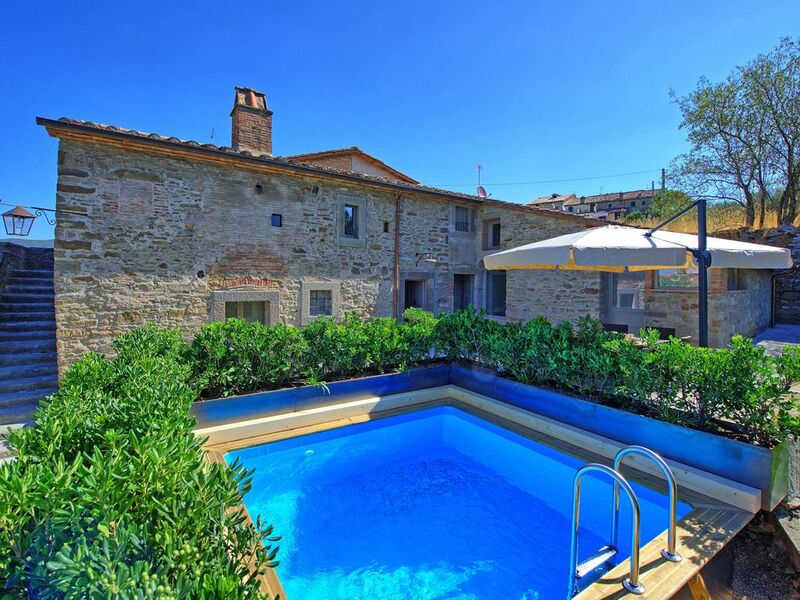 Beautiful villa with swimming pool for rent in Tuscany at the foot of Cortona, a historical town whose origins where formed during the Etruscan age. The property was completely refurbished in 2017 and it is welcoming interiors offer a lovely mix between a modern style and the original characteristics of the house which originated at the end of the 1800’s. Outside, guests can enjoy furnished space and a beautiful square swimming pool. The house has air conditioning in every bedroom, in the living area and in the dining area. The geographical location of Villa la Fonte allows for easy visiting of Cortona and all of the main cities in both Tuscany and Umbria. In the town of Camucia there is a wide range of shops and a train station. Available to guests: garden and private swimming pool (3 x 3 m; depth: 1,2 m), air conditioning, Wi-Fi internet connection. Distances: the centre of Camucia has shops of every kind and a train station – all in a range of 600m, Cortona - 3 km, Perugia - 45 km, Siena - 80 km., Florence - 115 km, Lake Trasimeno is just 15 km away. Ground floor: entrance into living room (air conditioning) with satellite TV, laundry area with washing machine, bathroom with shower. 3 steps above: dining area (air-conditioned), kitchen (oven, freezer, dishwasher) and access to outside. 2 steps blow (from the living area): double bedroom (air conditioning) with outdoor access. First floor: double bedroom (air conditioning) accessible also from outside, bathroom with shower, twin bedroom (air conditioning) and bathroom with shower. This house is just as beautiful as the photos! We had a great experience here and the house exceeded our expectations. The owners were very kind and easy to work with and the house is fully stocked with everything you need. We will absolutely be back and rent this villa again! Impeccably maintained with modern upgrades for kitchen and baths. Easy access by car to Cortona and accessible to highways for day travel. Several walking distance bar/cafes and restaurants. This home was fantastic. It is a well-preserved 16th century farmhouse that has been well restored with very modern touches and a keen sense of decoration. We greatly enjoyed our stay. The kitchen was well equipped with quality cook-wear and utensils. You are a 4 minute drive from the heart of Cortona. We absolutely loved this place. This centuries-old home has been fantastically renovated and beautifully decorated and appointed but keeps a lot of its old-warm charm. Bedrooms are large, bathrooms are very clean, and kitchen is very well furnished. It would be easy to settle down here for an extended period. The home sits within the town of Camucia and is only about 1 mile down the hill from Cortona. There is plenty of You are walking distance to groceries and restaurants in Camucia. The owners are wonderful people -- very attentive and easy to deal with. Very highly recommend.